Water Jet Tile Cutting Applications - W. Haut Specialty Co., Inc. When our customer approached us they didn’t quite know what pattern they were looking for so we all joined our creative ideas together and came up with a beautiful center piece. 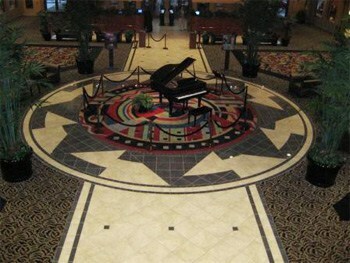 Our 3 Waterjet operators have many years of creative ideas and procedures for working with tile. If you don’t have a specific idea of what you are looking for, we can help create different ideas for you until you decide which one will look best for your tile application, adding our creative ideas along with the customer results in some great designs. 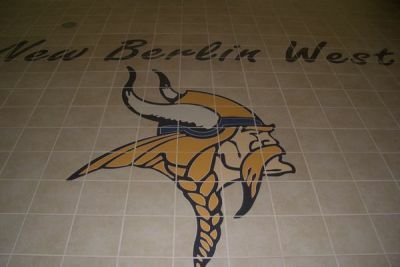 This project started with a picture of a vikings head that our customer wanted, but didn’t have access to a Cad drawing. W. Haut Specialty has 4 different brands of Cad/Cam software, all of which work great for creating intricate plans such as this one. We can “trace” a picture you have and put it into a dxf file which the machine can read. Our water jet cutting service can cut ferrous and non-ferrous materials, glass, stone, plastics, rubber, foams, aluminum, steel, stainless steel, granite, tile, marble and wood to mention a few. Waterjet cutting has been applied to a variety of projects, including exterior signs, industrial lettering, intricate marble tile patterns, architectural details and custom artwork. Waterjet cutting can be used to cut bores and rounds, later finished on lathes. Die components, such as lower die shoes with slug clearance or stripper plates, can also be cut. Our waterjet cutting service offers endless possibilities waiting for an imaginative challenge by our customer. Cutting problems or ideas… give us a try. See more examples of our water jet cutting in our photo gallery!